We are in a unique position to deliver a bespoke service to suit your business environment in order to satisfy the Electrician at Work Regulations 1989. Undertake Electrical power and network drawings to identify the details of your LV system. Whilst drawing the electrical network any dangerous defects will be highlighted for immediate investigation or rectification. We can also identify priority areas for testing. Testing may be undertaking on the whole site or broken down into sections. For example, commercial you could test 20% every year and have a full certificate after 5 years. The regulations advise that test results should be kept throughout the working life of an installation. These results can be used as evidence of maintenance. With our service, we can provide you with 24 hour access to your results online as well as a hard copy for your records. Following completion of a full inspection, a reduced level of testing can be undertaken with the records of such being constantly updated throughout thereby reducing the cost. © Copyright 2019. 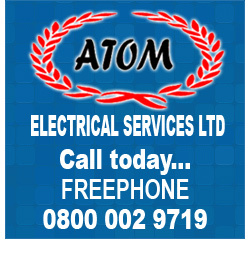 Atom Electrical Services Ltd. All Rights Reserved.